"The book under review concerns mathematical cryptography: it presents old and new concepts and methods, which clearly show how mathematics is crucial for modern purposes. 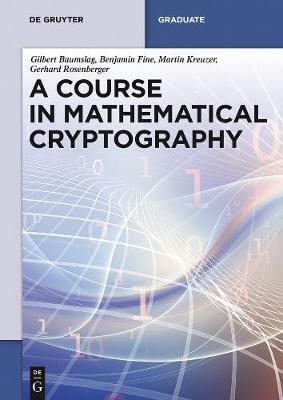 [...] Surely this book will provide an important service for the community: it will be useful for graduate students who want to be introduced to the subject, for postgraduate students who want to be acquainted with the different aspects of cryptography, and for researchers who want to know recent results in the area." "Es werden alle relevanten Themen f r eine Lehrveranstaltung besprochen." Gilbert Baumslag ; Benjamin Fine, Fairfield U., USA; Martin Kreuzer, U. Passau, Germany; Gerhard Rosenberger, U. Hamburg, Germany.